Primary Assistant teacher recruitment system is fulfilled with quota distribution system. These quota are collected from female, freedom fighters, freedom fighters sons, grandsons, pets quota, ansar quota, orphan quota, autistic quota. Amount of these quota is about 96%. 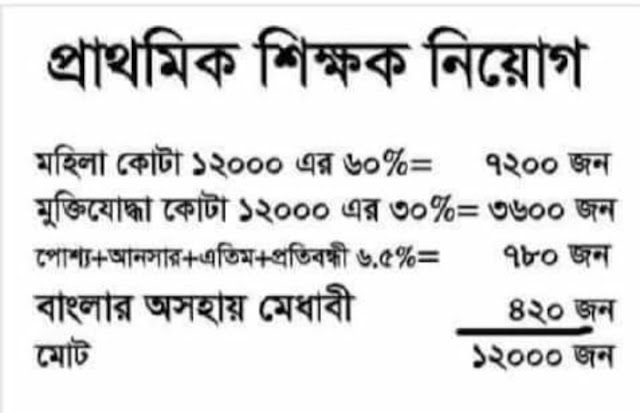 Only 4% quota is reserved for helpless male meritorious students of Bangladesh. Helpless general male students quota is only 3.5%. Is not a discrimination for the whole nation? - Question to the people of the whole world. About 12000 candidates will be recruited in coming circular. There only 420 male general helpless students will be recruited. Other 11580 seats are reserved for quota candidates.